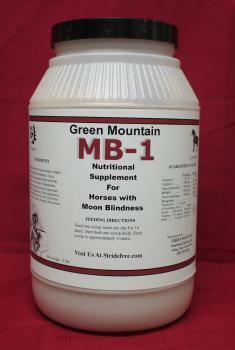 MB 1 is a nutritional supplement designed to help relieve the stress and discomfort of moon blindness in the horse. If you suspect you horse is having an eye problem you need to call your veterinarian right away to get treatment for your particular situation. Moon Blindness should be treated ASAP because it can cause permanent damage. In addition to your veterinarian’s program, we recommend MB-1. This product has been specially formulated to combat MoonBlindness and contains anti-inflammatories, vitamins, and antioxidants to help the horse’s immune response. MB-1 Contains specific Vitamins help to maintain membrane integrity, and help to reduce light sensitivity. 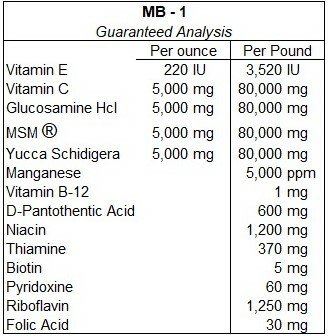 MB-1 contains vitamins E, C, B-12, Riboflavin, Pyridoxine, Niacin, Thiamine, Folic Acid, Biotin, and d- Pantothentic acid. MB-1 helps to reduce the discomfort and irritation in the eye by using the natural anti-inflammatories MSM and Yucca. Horse owners have had wonderful results. What Is Equine Uveitis aka Moon Blindness? Moon blindness is a disease in the horse’s eye caused by injury, bacteria, virus’, parasites and/or tooth root abscesses. Moon blindness is also known as Equine Recurrent Uveitis or Periodic Ophthalmia. What Are Some Symptoms of Moon Blindness? Some signs of Moon Blindness might be cloudiness, redness, swelling or watering of the eye, squinting and sensitivity to light which causes discomfort and pain. You may also see head-shaking, loss of balance, tripping, rubbing of the eye or white spots in the eye. So How Does A Horse Get Moon Blindness? Bacterial infections from leptospirosis, E. coli, Rhodococcus equie, and / or brucellosis can all contribute to Moon Blindness. Viral infections from Equine Herpes Virus and / or influenza can lead to Moon Blindness. Trauma to the eye such as a blunt blow or getting a foreign object in the horse’s eye can cause Moon Blindness. If you have any questions or feel your horse might have any or all of these symptoms— first, call your vet, then call Green Mountain Nutritional Services, Inc. and we’ll get some MB-1 on the way to help your horse have the best chance possible of stopping the damage! What Supplement Can I Give My Horse To Help Discourage Moon Blindness? MB-1 has been specially formulated to combat Moon Blindness and contains anti-inflammatories, vitamins, and antioxidants to help the horse’s immune response. MB-1 Contains specific Vitamins help to maintain membrane integrity, and help to reduce light sensitivity. MB-1 contains vitamins E, C, B-12, Riboflavin, Pyridoxine, Niacin, Thiamine, Folic Acid, Biotin, and d- Pantothentic acid. MB-1 helps to reduce the discomfort and irritation in the eye by using the natural anti-inflammatories MSM and Yucca. Are There Any Other Supplements That I Can Give My Horse Along With MB-1 To Help? If your program involves daily feeding of aspirin, bute, and/or bantamine you may want to feed Super Horse a potent digestive aid to replenish the bacteria in the gut and aid in digestion with a complete array of yeast and enzymes. Super Horse is an excellent product to feed your horse— anyways— it really helps to keep your horses immune and gut in the best possible shape! Because moon blindness can cause total blindness it needs to be treated as soon as possible by your veterinarian. Along with the standard treatment your veterinarian will prescribe, Green Mountain Nutritional Services Inc. has formulated a supplement to compliment your horse’s treatment that we call MB-1. Feeding Directions: Feed 1 ounce twice per day for 14 days (loading period). Feed 1 ounce once per day thereafter. This is an 80 day supply.